So what other things/people do I associate with Wigan? Well I can’t be the only person who’s pondered this because Wigan central library has a history of Wigan exhibition entitled something like ‘There’s more to Wigan than Pies’. And very good it is too. The World Pie Eating Championships (I kid you not) are held in Harry’s Bar on Wallgate apparently. 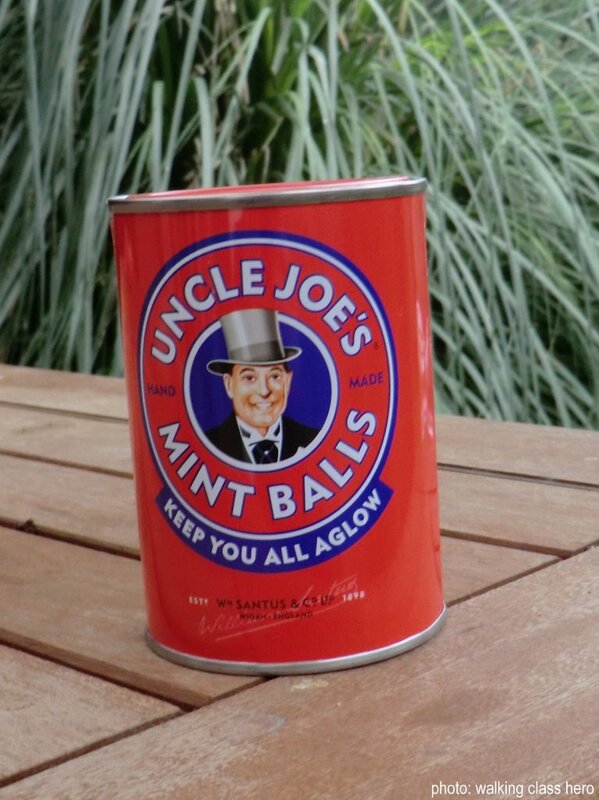 Uncle Joe’s gets a mention or two and there’s plenty about Rugby League and some chap called Billy Boston. Although I was always more of a Motown boy myself Wigan is synonymous to me with Northern Soul and the all nighters at the famous Wigan Casino. Check out the film – it’s all tight flares, feather cuts, tank tops and round collar shirts. And I mustn’t forget Stuart Maconie (more of him later although I could see no reference to him in the exhibition) who these days could justifiably claim to be Wigan’s most famous son. Of course, The Verve’s Richard Ashcroft might disagree about this though. At the time of my visit Wigan is the only English town with a Premier League football club, Wigan Athletic FC and a Super League Rugby League club (I’m probably displaying my southern ignorance in expressing it like that), Wigan Warriors. 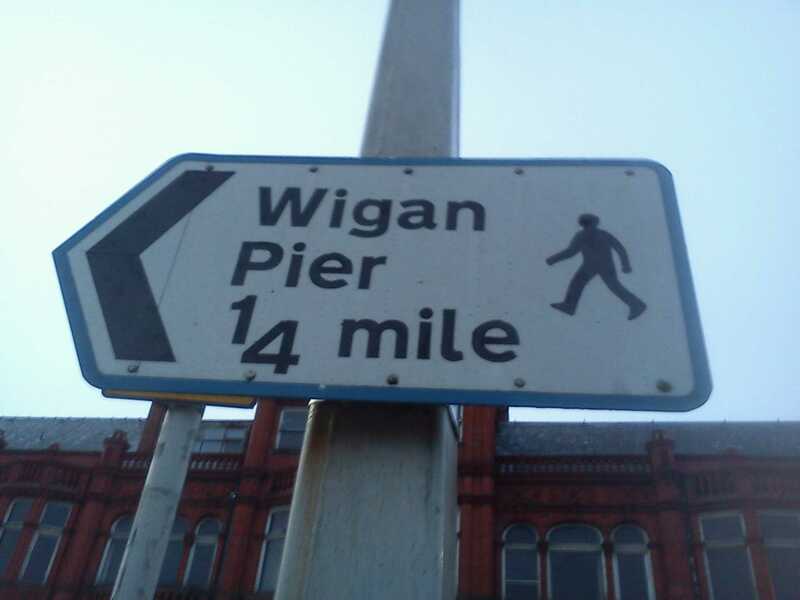 But I’m guessing most people associate the town with George Orwell’s The Road to Wigan Pier. Published in 1936 Orwell’s book paints a hellish vision of a broken Britain and today it seems curiously relevant to our own distressed times. An Old Etonian prime minister, in a cabinet stuffed with public school boys, has embarked upon the most radical reduction of public spending in generations, making cuts that have prompted robust criticism of their pace and scale. North and south are pulling apart once more – not yet to the extent where Orwell could describe his journey as if “venturing among savages”, but getting there. If you arrive by train from the south you pitch out at Wigan North Western. (Wigan has 2 stations – Wallgate is just over the road.) 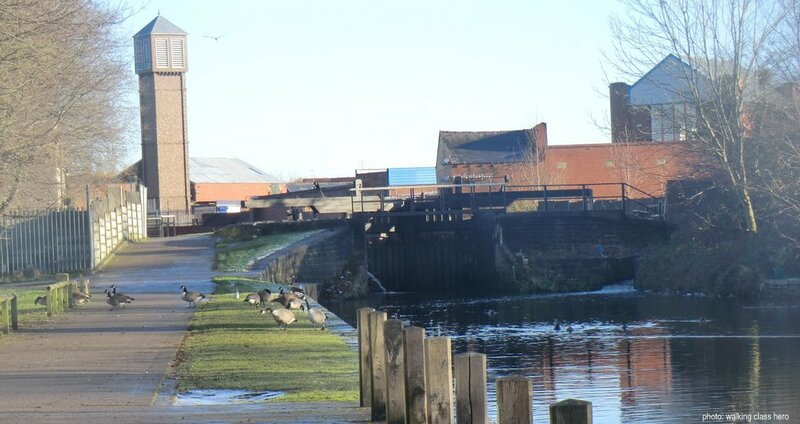 The first thing you see is a sign telling you Wigan Pier is a quarter of a mile away and then you notice the dilapidated parade of shops across the road. It seems to be mostly taken up by a pawn shop but there’s also room in the row for Totally Wicked’s shop selling e-cigarettes and e-liquid. I dread to think what e-liquid is or does? But it does come in 30 different flavours and 6 different strengths. I’m here first and foremost because I’ve never been before and to do a bit of walking round the town and the surrounding country. I’m also here to see Wigan play Chelsea. It’s long long time since I’ve been to a Chelsea away game outside the capital indeed I might never have seen them play outside London since the Premiership began. It’s a Saturday evening kick-off courtesy of ESPN and as the ground is filling up I’m reminded of one of the best examples of ‘terrace’ banter in recent years. Ashley Cole is one of those players who arouses disproportionate ire amongst opposing fans and as he plays left back he spends quite a lot of the game near these fans. (I can sorta see their point of view though – after last year’s airgun escapade Coldplay’s lyric from Lost: ‘Every gun you ever held went off’ couldn’t be more appropriate.) Anyway the afore mentioned Stuart Maconie, Wigan fan, during a recent game a few years ago, is believed to have spent an entire half bellowing at Cole that he’d sold more books than him . The middle classes have truly taken over the workers’ game. The dismal 1-1 draw (Chelsea were pedestrian and unimaginative) could have done with some livening up by witty instead of inane chants. 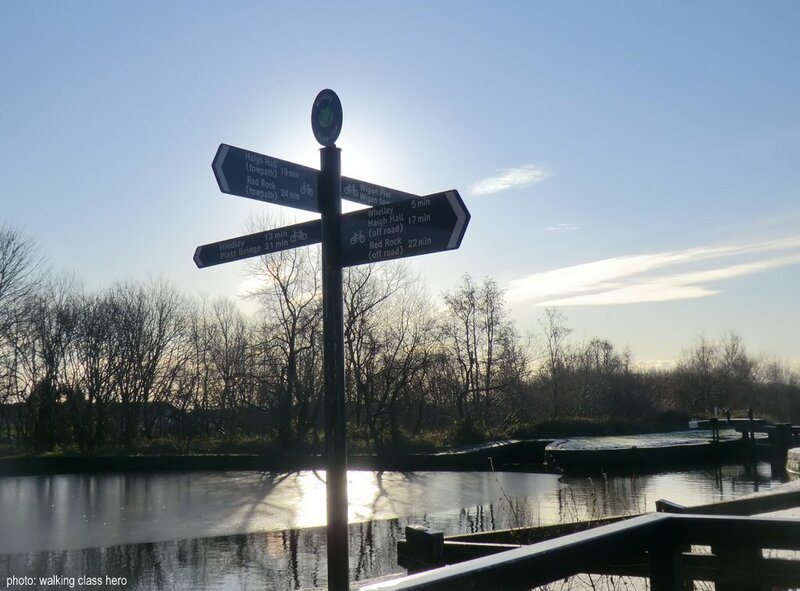 Walking along the Leeds-Liverpool canal Orwell reported: “Terribly cold, frightful landscape of slagheaps and belching chimneys. A few rats running through the snow, very tame, presumably weak with hunger.” The mill girls, scurrying to work in their clogs down the cobbled streets, sounded to him “like an army hurrying into battle”. The next day I’m walking alongside a snowy Leeds-Liverpool canal. There are no rats I can see and none of the chimneys are belching. 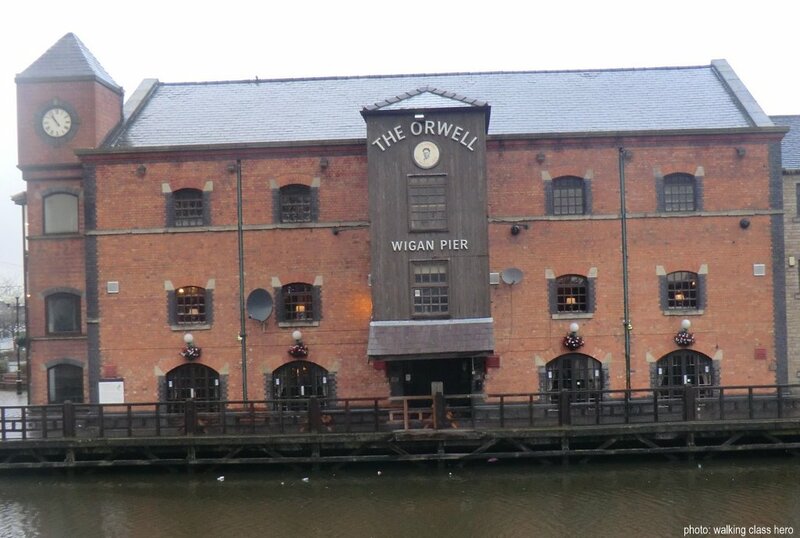 I stop just past The Orwell – a pub named in honour of the author that I’d visited the night before. I can’t help wondering what the old Etonian would have made it. I can’t help agreeing with Stuart Maconie (last mention I promise) about Wigan girls and sun bed tans. Without exception every young woman in the pub had dyed blonde hair, a tikka tinged deep tan and sounded like Victoria Wood. A visitor from out of space would be drawn irrevocably to the conclusion that the tanning process doesn’t work on men or women over the age of 25. Strange. On leaving Haigh Hall I headed down towards the town following the River Douglas where I could. J B Priestley, in his English Journey, has this to say about Wigan: “Between Manchester and Bolton, the ugliness is so complete that it is almost exhilarating. It challenges you to live there. That is probably the secret of the Lancashire working folk.” Come on Priestley, Wallace and Gromit live there mate. But I guess if there’s anything worse than a Londoner commenting on Wigan it’s a Yorkshireman. And this Londoner thought the place was well worth a visit and was glad he had made the journey – it’s not everywhere you can get e-liquid and snaps.